Full disclosure: the next sentence is oovy groovy, and if that kind of thing makes you nauseous, feel free to skip ahead. At the start of 2014, my friend Ali and I made vision boards. Mine had lots of things on it, like maps of New Zealand and Alaska, women running into mountain sunsets, skiers riding powder. And a helicopter. I dreamed of heliskiing. Fast forward more than a year. 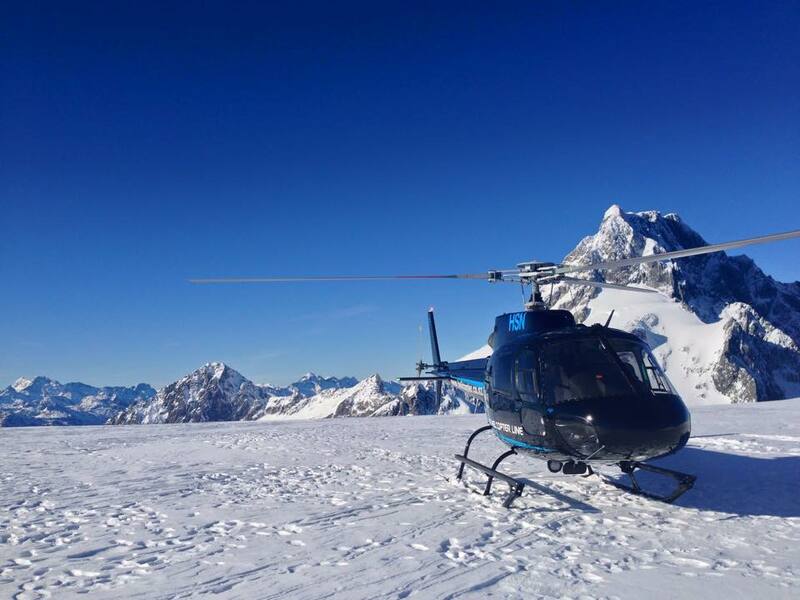 I recently landed a gig doing marketing with a South Island heliski company, which means that heliski trips are in my very near future. While I’m not taking glorious powder turns down glaciers yet (we just need a little more snow here), the helicopter from my vision board just made its first appearance in my life. In an effort to get their marketer up to speed on what really happens in a helicopter, the company put me and a friend on a scenic heli-cruise-fly trip to Milford Sound for free. It’s normally an $850 trip, or $450 for the fly-cruise-fly option. If you have the money for a splurge, I HIGHLY recommend it. 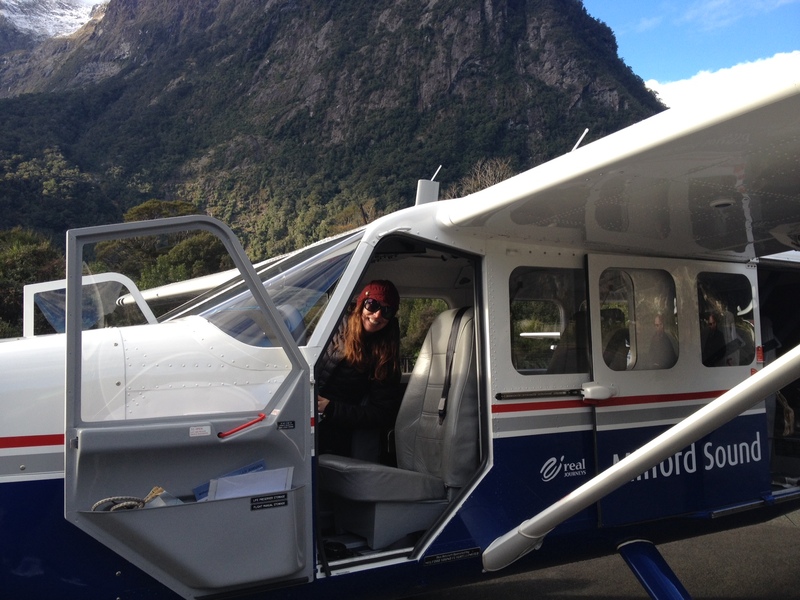 Here’s a taste of this adventure with Milford Sound Scenic Flights. To say that my friend Jess and I were giddy as we boarded the chopper from The Helicopter Line is an understatement. We were ecstatic. We were like little kids. We probably annoyed the hell out of the other four passengers who crammed in with us. We couldn’t stop giggling as the helicopter lifted straight up like magic into a bluebird sky. I’d never been in a helicopter. It was one of the coolest experiences of my life. 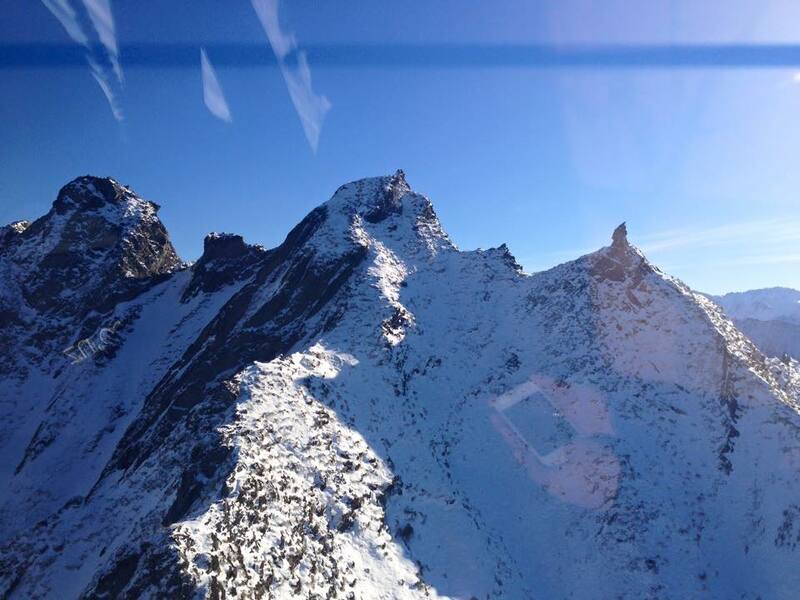 Our pilot flew us right next to snowy ridge lines, buzzing the length of entire mountain ranges in mere minutes. I was gazing down at all the peaks I’d looked up at over the last months from Glenorchy, the Caples and Greenstone valleys, the Routeburn, the Eglington valley. I was floored (or high?) at this new perspective. Our pilot announced that we would be landing on a glacier shortly. What. 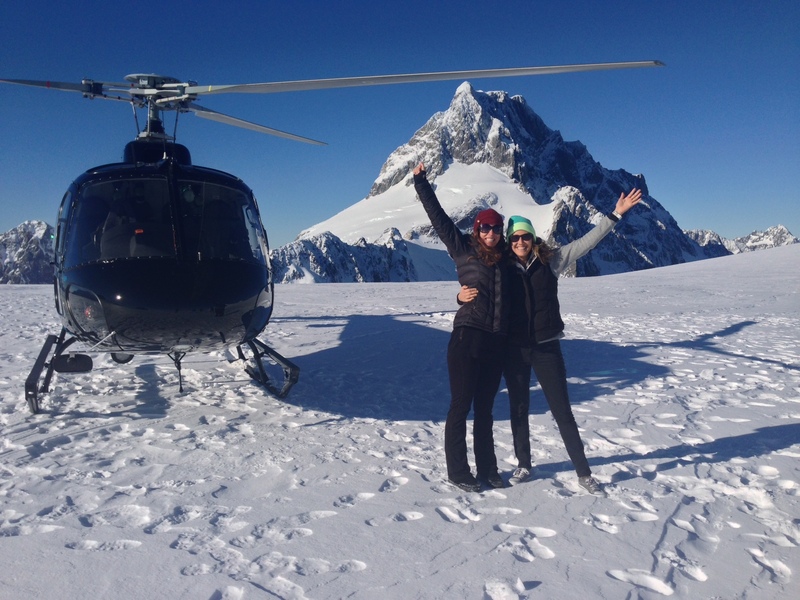 Jess and I had no idea that was part of the itinerary; I think we actually squealed as the helicopter gently touched down on a mountaintop glacier in the Southern Alps. We stepped down from the cockpit and literally frolicked on it. It’s debatable whether our co-passengers thought we were charming or totally nuts. 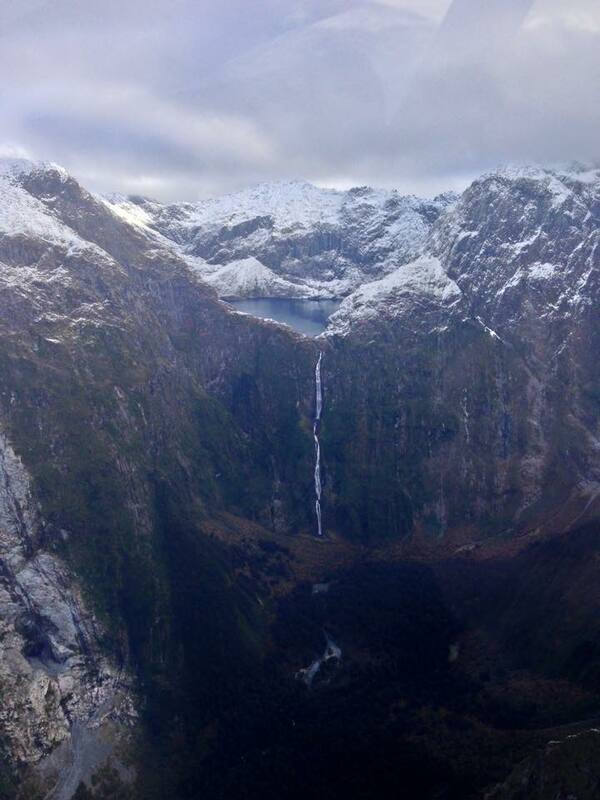 Back in the heli, Milford Sound came into view in all its glory. Our pilot made another magic helicopter landing and we spilled out into the sun for the next phase of the adventure. 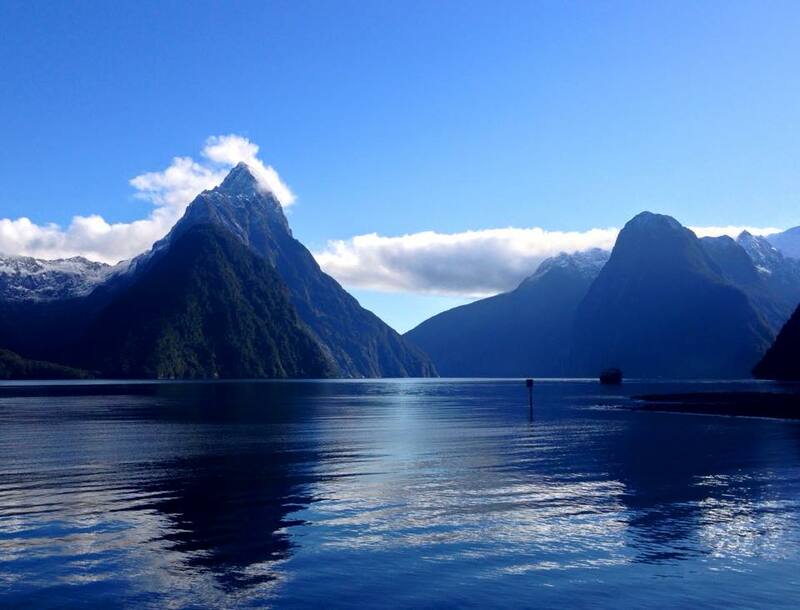 Milford Sound is one of the wettest areas on earth, receiving an average of 268 inches annually. It rains over half the days of the year. We were so incredibly lucky to see the eighth wonder of the world on a clear sunny day. We boarded Mitre Peak Cruises’ cozy little boat and went straight for the free coffee. Equipped with hot drinks, we headed to the top deck for 360 views of legendary Mitre Peak, Lady Bowen Falls, Stirling Falls, and sheer rock faces rising almost 4,000 feet out of the sea. Milford Sound is magical. I don’t have words to describe the beauty of this place, so I won’t try. Get there if you can. I have to admit we were a little tired after sustaining an awe-struck state for the last three hours (it takes a lot of energy, let me tell you). We perked up considerably as we headed back to the Milford Sound tarmac and discovered we had our own personal fixed wing for the ride home to Queenstown. That’s right: just me, Jess, and our pilot. We flew back across a different route, treated to a new swath of mountain ranges. The highlight by far was the magnificent Sutherland Falls, the highest waterfall in New Zealand at 1,900 feet, spilling from Quill Lake straight down a massive rock face. Unbelievable. Our pilot banked the tiny plane left and right to give us the best views of alpine lakes and glaciers. We flew back over Lake Wakatipu, and as the fabled Remarkables came into view, all I could think was how lucky we were to get to do something like this. Back on the ground, Jess reminded that she was the lucky one for getting to tag along with me. I worked for this. I made a conscious decision to follow my dreams, and it wasn’t easy—quitting a good job and the promise of a steady income, leaving family, friends, and my canine soulmate for the unknown. But that decision, pinning that helicopter on my vision board a year and a half ago, was the start of the journey that led me here to this: helicopters, glaciers, snow-covered peaks, and bluebird days. I’ve arrived at my destination, and damn, it’s a good place to be.